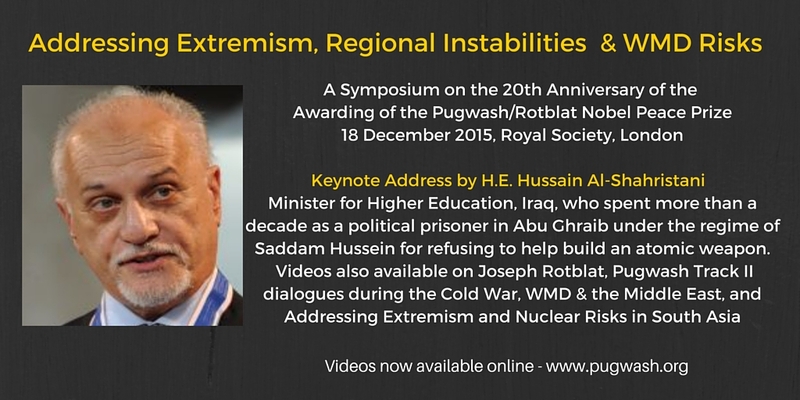 On 18 December 2015 Pugwash explored our current themes and honored past achievements with a special event, “Addressing Extremism, Regional Instabilities & WMD Risks: A Symposium on the 20th Anniversary of the Awarding of the Pugwash/Rotblat Nobel Peace Prize.” The small private event took place at the Royal Society in London and was broadcast to viewers around the world via Pugwash’s first ever live webcast. It was followed by a roundtable discussion. It was organized in cooperation with the British Pugwash Group, and co-sponsored by the Centre for International Studies and Diplomacy, SOAS. The videos are available below. Message from Pugwash President Jayantha Dhanapala on the 20th Anniversary of the Pugwash/Rotblat Nobel Peace Prize. SPECIAL KEYNOTE ADDRESS – “A Stand Against WMD and Extremism in the Middle East: A Personal Journey, A Regional Imperative” by H.E. Hussain Al­Shahristani. Minister for Higher Education, Iraq. Dr. Al­Shahristani has served previously in several posts, including as Deputy Prime Minister for Energy Affairs, Minister of Oil, member of the Iraqi Parliament, and as First Deputy Chairman of the Iraqi National Assembly. He has been a Professor at Baghdad University and a Visiting Professor at Surrey University in the UK, and is former Head of the Iraqi National Academy of Sciences. Dr. Al­Shahristani spent more than a decade (1979­-1991) as a political prisoner in Abu Ghraib prison under the regime of Saddam Hussein. First arrested for his opposition to the government’s persecution of political opponents and kept captive after his refusal to help the regime build an atomic weapon, he escaped during a bombing raid on Baghdad during the First Gulf War. He is the 2012 Laureate of the Freedom from Fear Award. Please click here for a PDF of H.E. Hussain Al-Shahristani’s presentation. Comment by Dr. Rim Turkmani, a Syrian astrophysicist, Founder of Madani, an NGO that supports the role of Syrian civil society in the peacebuilding of Syria, Research Fellow LSE, former Hodgkin Fellow, Royal Society (Comment and Q&A starts at 46.00). “WMD and the Middle East – What’s Next” – Pugwash Council member Dr. Patricia Lewis (starts 50 seconds) and Pugwash Council Member Amb. (ret.) Sergey Batsanov (starts 18.00). Q&A starts 45.00. For additional information, please see the full programme (PDF). A report on the day, including the roundtable, will be forthcoming. For more information about the Pugwash/Rotblat Nobel Peace Prize please see the Nobel website: 1995 Nobel Peace Prize. At the November 2015 61st Pugwash Conference on Science and World Affairs, Pugwash officials provided the Nobel symbols of peace to the people of Nagasaki and Hiroshima.